Today is often called Low Sunday, not because it is a particularly low point, but simply because of the contrast from the previous week of uniquely emotional and engaging liturgies. In some communities, it is also a Sunday with low attendance since everyone had their fill of coming to church last week. But that doesn’t seem to be the case today at St. Matthew’s! Easter continues this Sunday (and every Sunday). Today we hear the two appearances of the Risen Lord before the disciples. After a Sunday of proclaiming this remarkable miracle of Jesus’ resurrection from the dead and the joy and proclamation and song that goes with it, now we get down to the hard question. Yesterday I joined my family for an excursion into the city to see The Book of Mormon on Broadway. I’m not sure sharing the plot here is quite appropriate, but it does involve the belief in something that is seemingly ridiculous – to me and probably to lots of other Christians. But many of these dancing and singing young men in pressed white shirts tucked neatly into trousers with non-descript neckties showed the passion one can have about one’s belief system. John’s gospel gives us some examples of how we believe and how we as humans are always seeking proof before being convinced of the truth. Is this something we’d be willing to dance and sing about? On the evening of Easter day, the frightened disciples are gathered behind locked doors. Just days earlier Jesus had been brought before Pilate on a charge of sedition, all of them had reason to think that they might be accused as well, because of their association with him. If we recall the readings from the Passion of Luke and John that we heard our confirmands read on Palm Sunday and Good Friday, we’ll recall that when it came to the time of trial, all of Jesus’ disciples abandoned him. Even we shouted, “Crucify him! Crucify him!” a little over a week ago..
And it is today’s gospel that we find them holed up in fear for lives. In John’s account, Mary Magdalene had told the disciples that she had seen Jesus alive. Peter had gone and found the tomb empty. But none of them had given credence to a bodily resurrection, and they were not ready to believe Mary’s report. As the passage begins, it is late on the day of the Resurrection. No longer restricted by physical limitations, the Risen Christ simply appears within the locked room and greets the disciples with the words, “Peace be with you” (20:19). He shows them the wounds on his hands and side, and as he repeats the phrase again, the disciples rejoice as they recognize him. “Peace be with you.” Shalom. These are words of greeting, but in this case they are also words of forgiveness. All of those gathered are the same who had abandoned Jesus on the cross. In Jesus’ words and action, we see the pattern of forgiveness and reconciliation that is necessary for a community of faith. Even though they had abandoned him, he returns to them, greeting them as a friend – offering Shalom. Shalom is more than just simply peace; it is a complete peace. It is a feeling of contentment, completeness, wholeness, well-being, and harmony. Not only is Jesus whole, he is at peace with those who abandoned him. And he comes to us today, offering forgiveness. One week later, the disciples again are gathered. Already they are observing the first day of the week as a celebration of the Lord’s Resurrection. It is the 8th day of the week – a new creation. However, this time Thomas, who had been absent the week before, is present. When told of the Lord’s previous appearance, Thomas had stated the need to see for himself the physical proof of the wounds of Jesus. Why such fixation on his wounds by Thomas? And why, if Jesus had been raised to new life did God not heal his wounds? In overcoming death, why were the scars so plainly visible? Why must Jesus enter everlasting life eternally bearing the wounds of life on earth – the nail marks in his hands and feet, the scare from the spear that pierced his side – plainly and visible for all to see? In working with the confirmands to rehearse the Passion readings, we talked about the horrible nature of crucifixion. We talked about how the two on either side of Jesus had their legs broken as they were taken down from the cross to insure they wouldn’t escape – as if they could stand! But Jesus did not have his legs broken. He was already dead. Instead his side was pierced by a sword. A question was raised – why, if he was already dead? Doing a little research I discovered that this was a way to verify he was dead – Jesus’ lungs or stomach had already filled with water and blood due to his asphyxiation. So there was no question – he had had a coronary rupture from hanging on the cross for so long. The story of “Doubting Thomas” has been depicted in many works of art throughout the ages. Perhaps the most famous is Caravaggio’s The Incredulity of St. Thomas. This painting entirely focuses attention on the drama and close encounter between Jesus and Thomas. 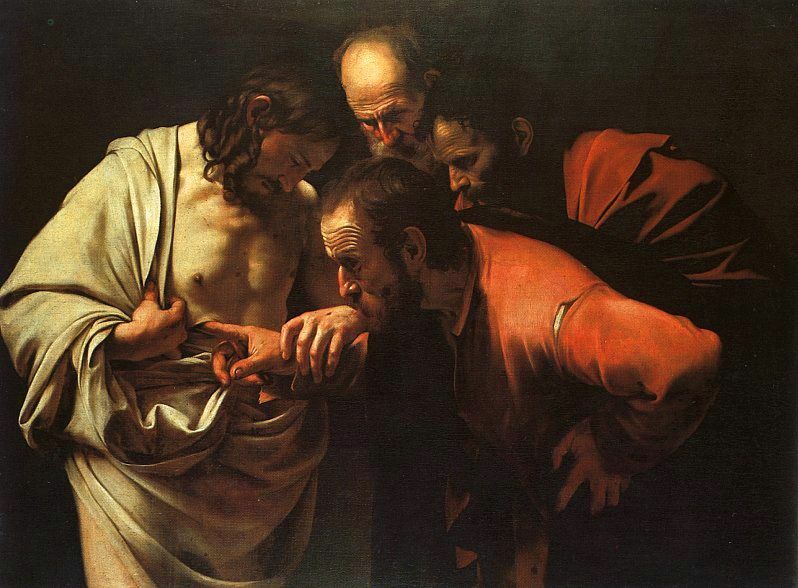 In an excruciatingly realistic interpretation of his determination to satisfy his skepticism, Thomas raises his brows and peers with almost squinted eyes into the open wound in Jesus’ side. In the painting, strong natural light illuminates his face, which heightens the drama. 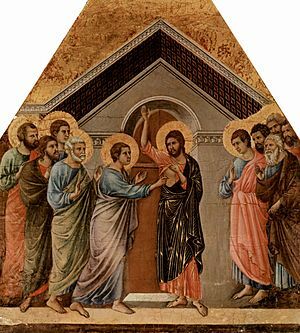 Jesus, pulls back his garment to expose his chest and guides Thomas’ hand as he inserts his finger into the wound. The gaze of two other followers is utterly fixed on the action. It is not until Thomas puts his hands in the wounds that he knows Jesus is truly alive. It is not until he sees and touches the scars that he can proclaim, “My Lord and my God!” The wounds prove to Thomas that the risen Jesus is real. Just like the wounds had previously proven that Jesus was dead. 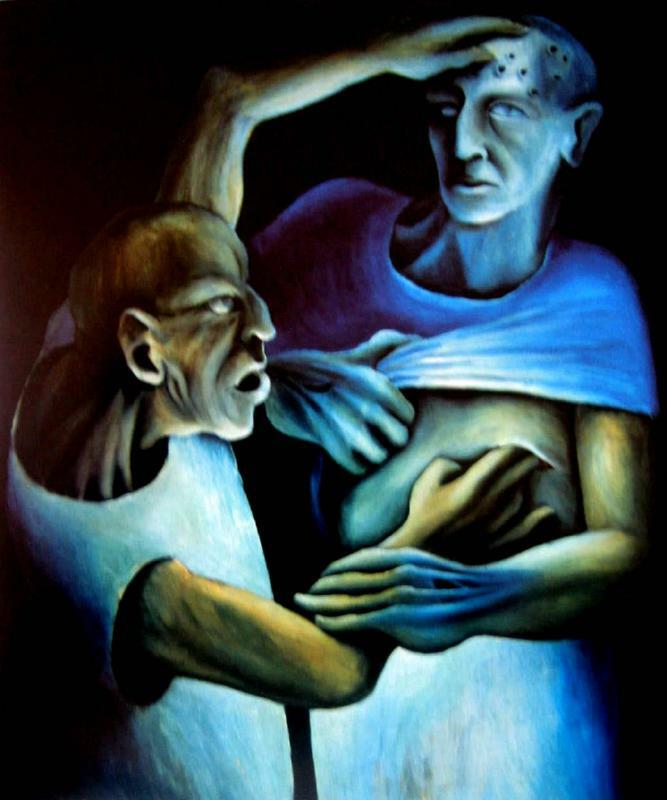 There is another painting by a contemporary artist, Michael Smither, Doubting Thomas. Hanging in a church in New Zealand, in this large mural there is a contrast between light and deep shadow, suggesting anxiety as well as intimacy in a room of figures crowded together. In addition to the disciples, there are women, children and pets present. Different than Caravaggio’s play with darkness and light, there are contrasting colors of clothing and sharp angles caused by the movement of the figures. It is an atmosphere of excitement and electricity. Lit only by three candles, this scene also focuses on Thomas and Jesus. The wounds of crucifixion are apparent as is the pierced side of Jesus as he responds to the doubt of Thomas. Thomas is awestruck and appears on the verge of exclaiming, “My Lord and my God!” The others in the scene also participate in the observation. Looking at this painting we are confronted both with the possibility of doubt and the opportunity to enter vicariously into the peace that Jesus brought to the gathered crowd. And we are forced to see that God does not heal Jesus’ wounds. The scars of this life follow Jesus into eternal life. The wounded Christ comes to us saying, “Peace be with you,” and invites us to feel his wounds, to touch his scars. And in doing so, Christ also touches the wounded places of our lives. Not one of us goes through life unscarred. Even if we do not have physical scars on our bodies, we have emotional or spiritual scars – wounds of loneliness and loss, wounds of rejection and despair, wounds of failure and fear. But we are reluctant to show our wounds. Unlike the risen Chris who openly invites us to touch his scarred and wounded body, we hide our imperfections, pretending that we are whole even if we are slowly bleeding to death. The wounded Christ shows us that we must not deny our own wounds. The wounded Christ comes to us and does not wait until we are perfect to meet us. The wounded Christ meets us at the places of our own wounds. It is through our wounds that we can enter each other’s lives. In past ages, and perhaps for us today, Thomas has been a figure with whom Christians have identified with. We desire some form of proof before we’re willing to invest our faith. And Jesus is ready to be present for us to see and touch. For us today, we can touch and we can taste each time we gather at the Lord’s Table. Jesus is calling us out of our locked rooms, to go out and proclaim his resurrection by sharing peace and being ministers of reconciliation. In practicing resurrection, we must also be vulnerable. We need to be authentic in sharing our doubts as well as our scars. We are all human. We carry burdens seen and unseen. It is in recognizing the woundedness in each other that we can begin to bring about reconciliation in our families, communities and the world. As we continue through these Great Fifty Days of Easter we will receive more glimpses of God’s coming reign when Christ’s work of reconciliation is fully realized. We will be called to follow Jesus and let God transform our hearts and souls. We will be asked to proclaim the Good News – the crucified Jesus was raised up and exalted by God to bring forgiveness to those who repent of their sins. Are we willing to sing and dance about it? Perhaps simply sharing the story with others. With our children – so that future generations can know the Story. Jesus entrust us with a mission, “As the Father has sent me, so I send you” (v. 21). We are called to go forth with God’s Shalom – “Peace be with you” (20:19) – words of forgiveness and reconciliation. Preached at St. Matthew’s Episcopal Church, Wilton, Connecticut on April 7, 2013 (Easter 2: Year C).